Ok, Spring. If you won't come to me, I'll come to you...in the form of food. Specifically, salads with fruit. I absolutely love fresh salads tossed with fruit in the warm weather. This curried chicken salad recipe features hints of Indian tandoori with the addition of greek yogurt and fresh ginger to the curry powder. Plump raisins and a drizzle of honey add a refreshing sweetness to the spice. A classic favorite with an ethnic twist, this recipe is absolutely delicious! Bring water and chicken broth to a simmer in a medium sized saucepan. Add chicken and simmer, uncovered. After 2 minutes (or when chicken is no longer raw on the outside) add raisins. Cook until chicken is cooked through, about 6 more minutes. Remove pan from heat and let chicken and raisins soak while preparing the rest of the dish. Whisk together all of the other ingredients: onion, green pepper, carrot, celery, ginger, mayo, greek yogurt, curry powder, lemon juice, apple cider vinegar, honey, dried basil, salt & pepper. Remove chicken from liquid and chop into 1/2-inch pieces. Stir in chicken and raisins to combine. 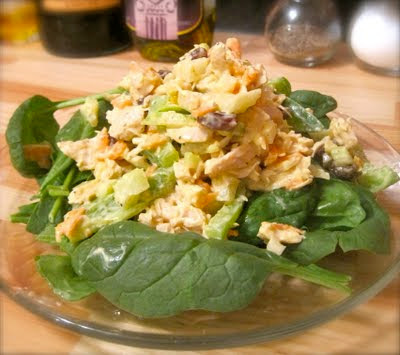 Serve over baby spinach/ spring mix, or in a sandwich with multigrain bread. Health Magazine names Greek Yogurt as one of the World's Healthiest Foods. In addition to containing multiple strains of probiotics, the "good bacteria" which boosts immunity and helps maintain healthy digestion, Greek yogurt has also been shown to improve lactose intolerance, build stronger bones, and lower blood pressure. Also, Greek yogurt is lower in sugar than most regular types. Trying to keep down the fat and sugar? Try Fage Total 0% individual fat-free yogurts, which separate the fruit-flavoring from the plain yogurt to let you monitor your own added sugar. "World's Healthiest Foods: Yogurt (Greece)." Health.com: Health News, Wellness, and Medical Information. 8 Feb. 2008. Web. 12 Apr. 2011. <http://www.health.com/health/article/0,,20410302,00.html>.